Ed and Jean lived in Winston-Salem from 1956-1959, and their first daughter Carolyn was born in 1957. In 1959, they returned to Southeastern Seminary in Wake Forest, NC, for Ed to finish his Divinity degree. They left Wake Forest College not knowing if they would ever return. In May of 1960, Ed graduated from Southeastern. The family then moved further away — to New York City for Ed to study one year at Union Theological Seminary. He had received a Danforth Scholarship. 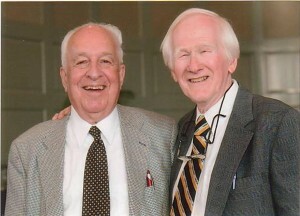 Ed Wilson and Ed Christman have been lifelong friends, because Ed C returned to Wake Forest in 1961. “Wake Forest has been too long without your presence, and I sure do wish you would consider returning to the campus as BSU Director if the opportunity presents itself. You’re one of the finest, capable young men I know, and goodness knows we need around here everyone we can get with your ability. Speaking for myself, and I’m sure many more would agree, I really would like to have you back among us. Wake Forest Chaplain L.H. “Holly” Hollingsworth made Ed a formal offer to become BSU Director in person. Holly was in New York City for the Wake Forest Demon Deacons’ basketball game in the NCAA Eastern Regionals. Coach Bones McKinney would not travel by airplane and Holly had driven him up for the game. As Ed told the story, Holly and Bones found him in the the Union library and asked him to come back to Wake Forest in the fall. “Certainly!” was his delighted response. And the Wake Forest basketball team? Fans will remember that this was the team with Len Chappell and Billy Packer. The Deacons soundly defeated St. John’s at Madison Square Garden in NYC. They next traveled to Charlotte and beat third-ranked St. Bonaventure before losing to St. Joseph’s. In the following season, 1961-1962, the Demon Deacons went all the way to the final four, defeating UCLA for the third place finish. Ed and Jean moved back to Winston-Salem in 1961, and Ed resumed his work as Baptist Campus Minister, which had been filled in the interim by Bob Knott. Soon, Ed had a new title and an expanded role in the college as Assistant Chaplain. The family settled in Apartment 2-D of the Wake Forest Faculty Apartments. Ed and Jean’s second daughter Kim was born in 1962. The years that followed were a lively time for the family and for all of the Wake Forest community. This is a picture of Ed’s 37th birthday in 1966. The Faculty Apartments were at this time a thriving community of both young faculty families and retired faculty who became friends and surrogate family for their young neighbors. The spacious and bright apartments, stately magnolia trees and generous yards were a backdrop for the rising intellectual energy on the campus created by the many new, young faculty members. Strong friendships were also being formed. Jean remembers this community feeling among the young couples. Bill and Mary Lou Cobb and John and Marilyn Roberts were among their friends during these years. One weekend, they came to the Christman apartment for Sunday lunch and ended up visiting and conversing until 5am the next morning. The Christman family was also close to the Vera and Janelle Brown family and the Frank and Kathleen Hasty family, neighbors in Building 2. These wonderful families became “local” grandparents and doted on Carolyn and Kim. The campus was vibrant with the hum of expansion and excitement. Enrollment had increased by 85% between 1957 and 1964. The graduate division, suspended in 1950, was reestablished in 1961 for six departments — Biology, Chemistry, English, History, Mathematics, and Physics. In 1961, Ed was 32 years old. He had an easy rapport with students. He loved introducing them to the breadth of what the campus had to offer, both academically and spiritually, and to watch them grow. Richard Mallory ’65: “I arrived on campus in the Fall of 1961 to attend the Baptist Student Union Pre-School Retreat just prior to freshman orientation. I had no idea of what I was entering. As green as green could be, I had never even seen Wake Forest until that moment. Ed had invited three different thinkers, each representing a different stream of Christian theology. One was a liberal from Duke Divinity School; another, a religion professor from UNC-Chapel Hill holding forth on neo-orthodoxy while the third was the editor of conservative Christianity Today magazine. 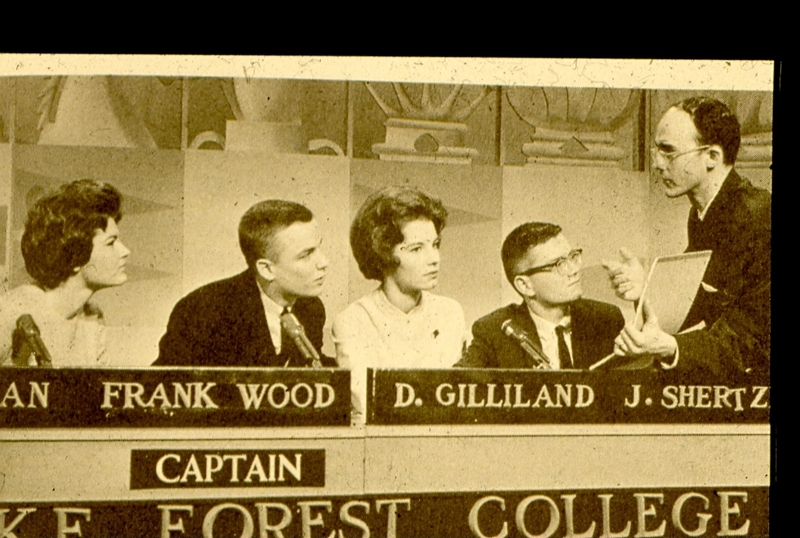 One example of the eye-opening events on the campus was a special religious event Ed directed, “Christianity: Force or Farce?” held February 11-15, 1962. This series of seminars addressed questions of the times, such as: Is the church obsolete? No man can serve two masters — how can a college? Christian faith and the crisis of our times; and the crisis of morals. Three “out of the box” speakers were featured: Dr. Herbert Gezork, German-born president of Andover Newton Theological School who had fled the Nazis in 1936; Mr. Kelly Miller Smith, an African-America pastor from Nashville, Tennessee; and Dr. Robert T. Handy of Union Seminary, a prominent church historian. While Ed was calling on the religious community to face social realities, he was also reaching out to serve the needs of all the students, including those not of the Baptist faith. 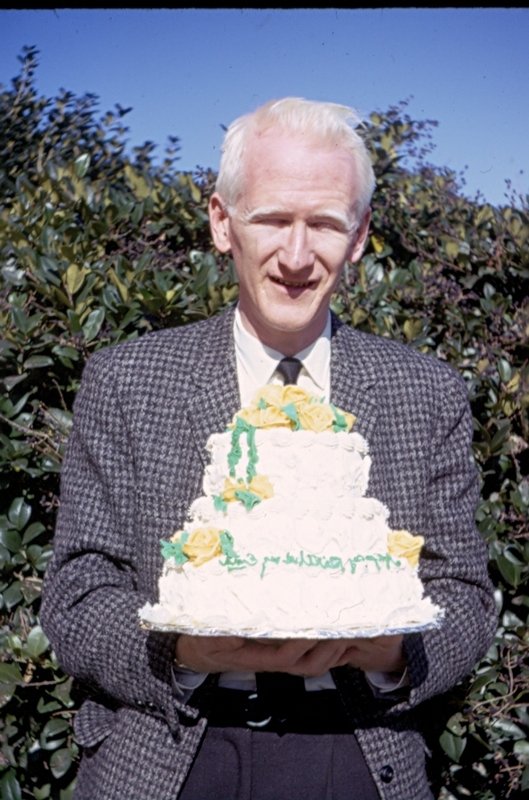 In 1963, he garnered office space in the library for part-time campus ministers who represented the Methodist, Presbyterian, and Episcopalian denominations. This was the physical expression of the collaborative Campus Ministry he would create. Jean also found opportunities on the new campus. She was a member of the Wake Forest College Club, which invited faculty women, faculty wives, and members / wives of the staff to join. (Student wives formed the Student Wives Club.) The club promoted social activities in a range of interest groups and expressed through meetings, meals, and events. She served as President in the mid-1960s. New leaders on campus: During this time, Wake Forest welcomed many new religious teachers and leaders. 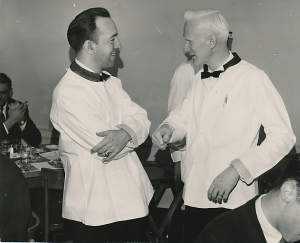 Between 1956 and 1963, the Wake Forest Religion Department had added several new faculty members, including G. McLeod Bryan, Dan Via, Bob Dyer, Carlton Mitchell, Charles Talbert, and Phyllis Tribble. At the Wake Forest Baptist Church, Pastor J. Glenn Blackburn announced his resignation in 1964, after sixteen years of service that spanned two campuses. Reverend Warren Carr, previously pastor at Watts Street Baptist Church in Durham, became the second pastor of the Wake Forest Baptist Church in Winston-Salem. Under President Tribble, the weekly chapel services were still required of all students. Students were increasingly resistant to compulsory chapel, protesting in a variety of ways including reading newspapers during the services and committing pranks. It began in April 1957, as the Wake Forest Trustees voted to allow dancing on campus for the first time since 1937, when it had been banned by the Baptist State Convention. There was an immediate uproar among Baptist leaders. Six months later, the Trustees rescinded their decision, but not before the issue of Wake Forest’s questionable morality had become a hot button issue among conservative Baptists and alumni. They railed against President Harold Tribble and lobbied for greater control of Wake Forest, including the Convention’s right of prior approval for any Trustees’ changes to the College’s charter. President Tribble, who had gotten Wake Forest through the move to Winston-Salem, knew that the college had to control its own destiny — and his required even greater separation from the Convention. An independent Board of Trustees was pivotal. In 1963, the Wake Forest Trustees adopted a Tribble resolution that would permit up to 16 of the 36 Trustees to be non-Baptist or non-North Carolina residents. The Wake Forest “Trustee Proposal” was put forward to the Baptist State Convention, where it needed two-thirds of the votes cast to be approved. In the months preceding the Convention, President Tribble, Chaplain Hollingsworth, and Assistant Chaplain Christman crisscrossed the state to visit Baptist leaders, local Baptist associations, and churches to lobby for the College’s proposal. In November, the proposal was 194 votes short, out of 2,700 cast, but Ed’s importance was nonetheless appreciated. A year later, the proposal was again submitted to the Convention but defeated resoundingly this time. The defeat made the road ahead more clear, even if difficult: 20 years later, Wake Forest University would cut all formal ties to the Convention, becoming formally independent from Baptist control. After the move to Winston-Salem, the most important change for the institution was its integration. Key steps in this process had begun between 1959 and 1961, while Ed and Jean were in New York. At this time, segregation was the practice at Wake Forest. With or without formal policy (the existence of such policy is unclear), the Admissions office rejected two black applicants for the college year 1958-1959, one from Africa and one from eastern NC. The office also rejected black applicants in 1960. The fight for integration of public facilities was already underway. On February 23, 1960, a group of ten Wake Forest students, along with twelve black students from Winston-Salem Teachers College (now Winston-Salem State University), were arrested for a sit-in at the F.W. Woolworth lunch counter in downtown Winston-Salem. The students –Linda G. Cohen, Linda Guy, Margaret Ann Dutton, Bill Stevens, Joe Chandler, Don F. Bailey, Paul Watson, Anthony Wayland Johnson, George Williamson, and Jerry Wilson — were likely the first white students in the country arrested in the sit-in movement. They were charged with trespassing and were jailed, bailed out the next day by L.H. Hollingsworth, Mark Reese, and Dan Via. The students would be celebrated later for their courage, but at the time they received no warm reception from other students back on campus. President Tribble commended the students for their “moral concern and activism,” but along with the rest of the administration, expected them to return to the dorms and classrooms. This was a spark that inspired, if not the student body, several student leaders. In the next few weeks, The Old Gold and Black called on the Trustees to adopt a “definitive” position on the admission of blacks. The Student Legislature voted nine to four, with five abstaining, to strongly recommend the end of discrimination in admissions. The trustees responded to this changing tide by chipping away at their rule of segregation, admitting blacks to graduate school, to evening classes, and to summer school. Yet they maintained the policy of segregation for any student who would earn an undergraduate degree. This is where things stood when Ed and Jean returned to Wake Forest in the summer of 1961. While some students were taking direct action, others began the process of what Ed would call the “end run” around the trustees. A group of Baptist Student Union members and other students organized the African Student Program (ASP) about 1960. The idea was to recruit and finance a black African student who would be presented to Wake Forest as a qualified international student, the product of Christian missions. Glenn Blackburn Jr., the son of the Wake Forest Church pastor, was a leader of this effort. The ASP raised the money for such a student to apply and attend Wake Forest: in 1960, tuition was $2,500. 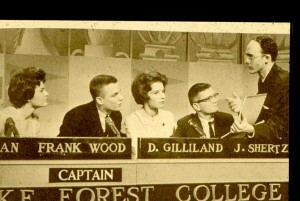 Frank Wood and Diana Gillian were two of the ASP supporters and also members of the Wake Forest College Bowl team, which went to the national finals in 1960. The team finished second and won $3,000, half of which was donated to the African Student Project. The students described this goal when they were interviewed on television during the contest. 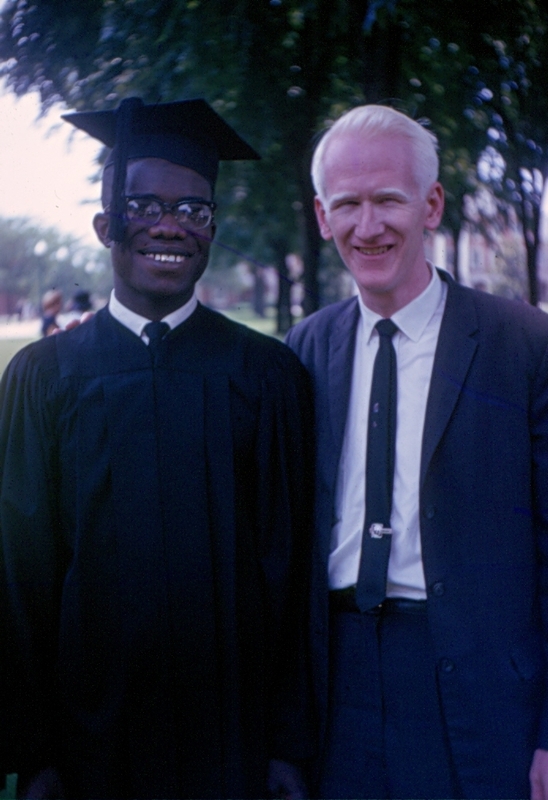 Baptist missionary Harris Mobley was working in Ghana, and it was he who made the connection between the ASP and African student Edward Reynolds, who had received excellent education in secondary school and was well-qualified for any American college. In April 1961, the trustees voted again to maintain segregation, and Reynolds’ application was rejected. The ASP funds brought Edward to North Carolina anyway, and he enrolled in Shaw University in Raleigh, a black institution. At this time, Shaw was rather “spartan” as Ed recalls, but Edward attended there anyway. He commented later on how the year there gave him an introduction to the black community in North Carolina and to American culture. During the Shaw spring break (when his dorm was closed), Edward accompanied Ed and a group of Wake Forest students on a trip to New York City. It was on this trip that he met Joseph Clontz, who would become his roommate. Ed Christman and Ed Wilson serving as waiters for a 1961 campus event to raise money for Ed Reynolds’ tuition. Ed C. was 32 years old. Finally, on April 27, 1962, the Wake Forest trustees voted 17-9 to abolish segregation at the College. Edward Reynolds would be admitted. Following Mars Hill College and Warren Wilson College in North Carolina, Wake Forest was one of the first major private colleges in the South and in the nation to integrate its student body. Ed’s Role: Next came the details. Since Edward’s application had been accepted, and he had finished the semester at Shaw, he came to Wake Forest for summer school in 1962, rooming with Barry Dorsey. He also worked on the campus grounds crew. Chaplain Hollingsworth asked Ed to find Edward a group of suitemates for 402 Taylor and a roommate for 402-B. Edward would need friends and supporters among his peers. Ed asked Joe Clontz, a rising junior from Charlotte and BSU member, to be Edward’s roommate. Joe had met Edward on a spring break trip of Wake Forest students to New York City and enjoyed his company. Despite his family’s resistance, Joe immediately accepted Edward as a friend and roommate, and he was excited about rooming with an international student. He roomed with Edward for junior and senior years of school, and they graduated together. In addition to Joe, Ed’s recruits to the suite were: Bill Brady, Glenn Clayton, Barry Dorsey, Ross Griffith, Kay Huggins, and Steve Orr. Mel Williams was another member of the “posse” who kept an eye on Edward all the time. He lived on third floor Taylor. In addition to suitemates, Edward had student friends — including Becky Funderburke Brown, Glenn Blackburn Jr, and Frank Wood — and faculty supporters included Mac Bryan, David Smiley, Allan Easley, Dan Via, Robert Gregory, and Carlton Mitchell. The Wake Forest staff, including housekeepers and grounds keepers also were a support system, giving him food and other small gifts. The other key element of Edward’s support system was the New Bethel Baptist Church in Winston-Salem, and Pastor Jerry Drayon and his family. This vibrant congregation served as a spiritual base and weekend home Edward and a connection to the black community in Winston-Salem. Edward Reynolds graduated from Wake Forest College in June 1964 to thunderous applause and a standing ovation. Joe Clontz, whose parents had been opposed his rooming with Edward, said later of his father, “I think he realized what I had done, even though he had fought it and resisted it, and had problems with it initially, accepted it finally.” The 50th anniversary of this accomplishment will be celebrated in 2014. Edward Reynolds went on to Yale University and a distinguished academic career. He even returned to teach summer courses at Wake Forest. Desegregation was accomplished, due to his courage and perseverance, and over the next few years, eight more black students graduated. Questions remained, however, about the difference between desegregation and true integration. These would linger well into the future. King on campus: Wake Forest had made a little progress, and the College Union invited Martin Luther King to speak on October 11, 1962. King, 34 years old at the time, spoke to an audience of 2,200 in Wait Chapel. This speech gained renewed attention in 2010, when an audio copy of it was discovered in the library collection. The speech was digitized, transcribed, and was made available online in January 2011. Wake Forest professors Susan Faust and John Llewellyn studied the speech and noted several images and themes that would be refined in the August 1963 “I have a dream speech,” considered King’s masterpiece. In the early 1960s, the Wake Forest campus seemed a long way from the city of Winston-Salem. Yet during the 1960s, the civil rights movement created some common interests between the university community and some city leaders. At the time, there were only a handful of pastors involved in the struggle for civil rights. In addition to Jerry Drayton, they were Jack Noffsinger of Knollwood Baptist (who taught an interracial bible school), W.R. Griggs of Southside Baptist, Mark Dep at Centenary, and Warren Carr at Wake Forest. In Winston-Salem, the power structure of prominent businessmen worked behind the scenes to do the good works necessary to protect their city’s reputation. In one glimpse of changes to come, in the early 1960s, five Wake Forest students wanted to live in a house in the Patterson Street neighborhood, a black and mixed-race neighborhood of Winston-Salem. The students — Bob Braxton, Beth Pirkle, and three others came to Ed for help. Ed approached President Tribble on their behalf, and the the plan was approved. Ron and Muriel Rice, members of the staff of the First Baptist Church, lived with them as house parents. When Dr. Harvey Cox of Harvard Divinity School was at the campus as a speaker, Ed took him to visit the Patterson Street community. In 1968, the Covenant House was established in the West End Neighborhood and college students lived there in order to learn from and engage with the community. This project was sponsored by Campus Ministry of Winston-Salem, which included Bill Kerkeval, Mark Rose, and Jack Viverette. These three campus ministers served Wake Forest, Salem College, and Winston-Salem State. The Covenant House was supported by Ed Christman, Provost Ed Wilson, Dean Lu Leake and Dean Tom Mullen. During the 1960s, a few Wake Forest students began to volunteer at the YMCA, the Experiment in Self-Reliance and other city organizations. Campus Ministry was for many years a focus for those interested in community volunteering. President Tribble Retires: President Harold Tribble had served the University since 1950 — through the move to Winston-Salem, the development of the new campus, expansion of the student body, integration, and the reestablishment of the graduate school. By the time of his retirement, Wake Forest had become a true university, secure and ambitious in its new home. His work was complete. In 1967, James Ralph Scales became the 11th Wake Forest president. Vice President Hubert Humphrey attended the inauguration. President Scales was able to turn his attention towards developing and expanding the spirit of academic pursuit at the school and in particular the development of the arts. He was also inclined to to support changes in traditional campus life — such as lifting the ban on dancing, mandatory class attendance, Saturday classes, and compulsory chapel — to fit the rapidly-changing world and expectations of students. Moravian Lovefeast: One of Wake Forest University’s signature events is its annual Moravian Lovefeast held the first Sunday in December. This event is the largest Moravian Lovefeast in North America and likely one of the largest in the world. The first Wake Forest Lovefeast was held in 1965, at the suggestion of Jane Sherill Stroupe ’67, a Moravian student. It was held in Davis Chapel and the New Philadelphia Band provided the music. The campus fell in love with the Lovefeast right away, and it soon moved to Wait Chapel. Ed organized and hosted this event, along with his fellow campus ministers. In the early years, then-secretary Jean Holcomb and many students wrapped beeswax candles in the Moravian style of red crepe. Later on, the candles were purchased due to the size of the event. Each year, a group of students, faculty, and staff would be invited to participate as ‘dieners’ to serve the simple meal of bun and coffee. Music was invited from campus groups such as the handbell choir and the gospel choir. At the suggestion of Professor Howell Smith, the Lovefeast later collected donations for Crisis Control Ministry, Samaritan Inn, and other Winston-Salem service agencies, and currently for the Chaplain’s Emergency Fund for the Wake Forest community. Each year the attendance increased, peaking in 1988, when there were 2,400 people — more than the fire code would allow. Attendance has remained at about 2,000 since then, and the Lovefeast remains the favorite holiday activity for the Wake Forest community. In 2014, when the Wake Forest Lovefeast turned 50, the University live-streamed the event from the website and promoted the shared celebration across the US and in six or seven other countries. Dress Code: During the 1960s, women students (also called coeds) had a dress code which required them to wear dresses/skirts on campus and in class. By 1968, the dress code had been relaxed to allow slacks on campus though not to class. In 1969, the dress code would be eliminated. End of Compulsory Chapel: Students were also asking for and receiving more freedom. One topic of great debate during the late 1960s was mandatory chapel, which was held each Tuesday and Thursday at 11am. All students were required to attend and sit in assigned seats so that attendance could checked. Chapel had been a part of the Wake Forest experience since 1834, but students of the late 1960s argued that these gatherings had become anachronistic for either religious or educational purposes and were no longer needed. A petition signed by 1,500 student was presented in 1968 to President Scales, who turned for advice to a faculty-student committee. The committee agreed with the petitioners, recommending that mandatory chapel be ended. The final required service was held on January 14, 1969. With this change, a Thursday morning 11am voluntary chapel time was established. The time would also be used for whole-campus events such as Founders Day and Convocation. In the midst of the exciting time of 1968, Ed received a scholarship for another year of study at Union Seminary in New York City. This time, he received a formal leave of absence from Wake Forest. Ed and Jean, with daughters Carolyn and Kim, moved back to the ‘Big Apple,’ a place they dearly loved, but secure in knowing that they would return to Wake Forest after the year of study and adventure was over. to get water to the sinks. raised the power bill fourfold. ain’t gonna kick this house no more. ain’t got time to fix the floor. nor to mend no window panes. even though we’ll go insane. This old house has frozen heat! all their kids have frozen feet! pouring water in the tank! this old house is making friends. till the spring thaw comes again. and it wards off sibling gripes. so we’ll do with just one car. in a single room at night. this old house has fancy meals. and the hot tea often spills. sure is hard on stopped-up drains. this old house once knew my wife. from the toils and storms of life. Chasing ‘Laino with a knife. (the the tune of – I’m ‘enery the Eighth I am I am … married seven times before … her eighth old man named ‘enery – the eighth I am).